Daniel Arauz is a Masters of Anthropology student at York University with an interest in male body image, gender, and food. When he isn’t researching and practicing his limited culinary skills, you can probably play against his mediocre King in Tekken 7. In games, such overwhelming, positive experiences often come from the resolution of an epic story, or completion of a difficult final boss. Think to the moment in which we complete a difficult final boss, with quivering hands and your heart in your throat as you land the final strike. But for me, it came from an unexpected experience: my first play through of Katamari Damacy. I want to consider how my own relationship with nostalgia, emphasized and taught by retro gaming channels on YouTube elevated my emotional connection to Katamari Damacy, even before I played it. I will then discuss how the game supports this childhood reminiscence through its music, tactile controls, and reproduction of “free play”. This will then be contrasted with the views of Katamari’s creator, Keita Takahashi and despite his intention to make Katamari a more pessimistic critique on consumer culture, I argue that he still presents a game that celebrates the joy, discovery and innocence of childhood. Katamari Damacy achieves all of its emotional weight without any complex story or characters, without surmounting any gameplay challenges. This simple game only occasionally deviates from your goal of making your Katamari as large as possible under a time limit. The little story that is provided is perfectly whimsical, light-hearted, and resembles folklore or mythology. After a night of drunken dancing, the King of Cosmos accidentally destroys all the stars in the sky. Naturally, he tasks you, the Prince, to restore the stars. It just so happens that stars are made by rolling up “stuff” with an infinitely sticky ball. Just like any mythology, this simple plot and characters themselves express a deeper network of meanings and associations. In Steven Reale’s Chaos in the Cosmos: The Play of Contradictions in the Music of Katamari Damacy, he notes that the King often dashes the Prince’s attempts to live up to his approval throughout the game. The King towers over the tiny Prince, and even when a level is successfully completed, the King still asks that next time, “we want a bigger one” (Reale, 2011). At its heart, Reale suggests the story of Katamari is that of the frustrations of childhood. Even though I grew up playing PS1, PS2 and Nintendo 64 games, one of the dominant parts of my gaming experience was what I learned through YouTube gaming channels. Before I was old enough to really experience nostalgia, I was already obsessed with the phenomenon by learning about those early experiences from older gamers. In the mid to late 2000s, I had near-unlimited access to information about retro and contemporary games through channels like Classic Game Room and the Angry Video Game Nerd. I knew that one day, I would look at my PS2 titles with the same fondness that a much older generation of enthusiasts reflected on the games of the 80s and 90s. Some of my fondness for certain titles during my formative years was produced before I had a copy of the games themselves. One of those games was Katamari Damacy. I watched gameplay videos, speed runs, and listened to the game’s famed soundtrack. Despite my fascination with it, I would have never anticipated that Katamari Damacy would be my first “happy-cry” experience with a video game. Katamari Damacy was often referenced by game content producers on YouTube, and its praise by some of my favourite reviewers is what initially piqued my interest. It was through the nostalgic lens that drives so many classic game enthusiasts that I learned an important lesson: the games that I played during these developmental years will have an unrivaled amount of cultivated memories associated with them. More importantly, this is worth celebrating and sharing with others. Despite my wishes, I never got the chance to do this with Katamari Damacy before I “grew up”. The YouTube videos still did their job: I was nostalgic for games I never played, and I desperately searched for copies of them later in high school. I often spent time at the local second-hand store searching for Katamari Damacy. Maybe it was just years of anticipation and curiosity, but I really think those videos instilled in me that nostalgia is valuable. Reliving and reiterating what made us excited as children is always worthwhile, even if that childhood wasn’t too long ago. I finally found a copy for five bucks at a pawn shop five years later, and completed the game that same day. I would have been seventeen. Maybe, the time and anticipation of this game just gave me a big soft spot for it, but by the time I was attempting to roll up the biggest cow I could find to the children’s choir of the song “Cherry Blossom Color Season (Cherry Tree Times)”, I was crying genuine tears of joy. Katamari Damacy captured everything that made childhood special, and more precisely, why it was so joyous to reclaim “play time” all to the tune of “Cherry Blossom Color Season”, one of the most powerful and serene tracks on the soundtrack. The game’s composer, Yuu Miyake even cited it as his favourite song from the whole series, a simple but powerful showcase of his ability to compose a song only with simple chords and melody (Napolitano, 2009). The moment was pure bliss. I have never felt so completely and holistically happy playing a game, and I think Katamari Damacy achieves this moment by virtue of its simplicity, which consistently evokes a sense of childhood, imagination and free play. Miyake’s simple song was coupled with straightforward gameplay and tactile controls. Together, these elements created the sense of pure joy and discovery that comes with exploring levels and discovering hundreds of new objects. The game does not get significantly harder as you play. I can recall failing the first two levels during my initial play through, but after really getting used to the game’s controls, and learning some general patterns about how objects were organized around levels, it was smooth rolling from there. But that feeling of “rolling” is also one of the game’s subtle, but crucial achievements. The controls almost entirely rely on using the two DUALSHOCK joysticks. They emulate the feeling of pushing a ball with your left and right hands. The controls allow you to imagine yourself as the Prince, rolling a ball forward or pulling one backwards, reorienting your direction by only pushing with one “hand”, and even revving up the ball to pick up a burst of speed by alternating the joysticks quickly, as if you were pedalling a bike. The Katamari Damacy control scheme. 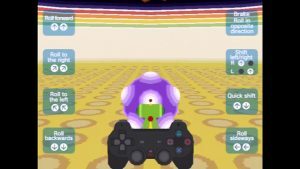 Katamari is an experience that could have only been achieved through this medium, but its controls make it feel as though you are almost manipulating something physical, like fiddling with a small toy. 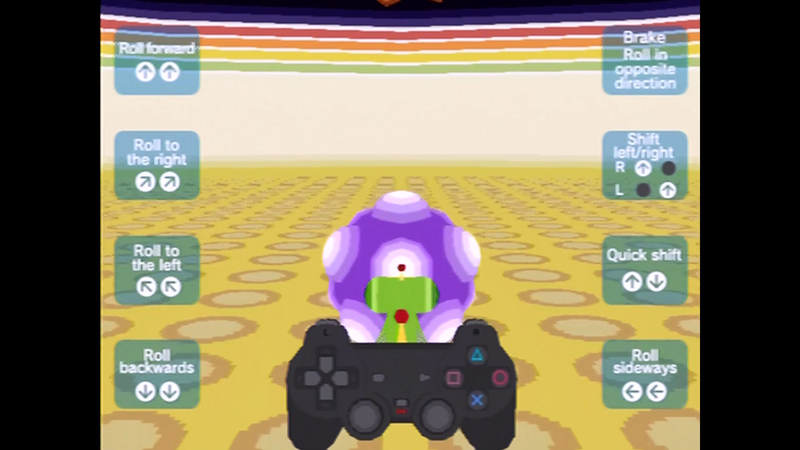 I think that sort of tactile control scheme is what ultimately contributes to Katamari’s evocation of childhood and play, and that theme is reinforced through a minimal story and simple win conditions. Takahashi, like Katamari, has built up a reputation for his offbeat approach to game design, but with a strong focus on making games that achieve the kind of joy that’s reflected in Katamari. In art school, he mainly studied sculpture, and he later joined Namco as a visual designer (Guillaume, 2011). His greatest inspiration for game design comes from museums and parks, and rarely other games (Kumar, Matthew & Nutt, 2009). After he left Namco, he began to work on designing a children’s playground in Birmingham, United Kingdom, and later expressed interest in the architecture and design of kindergartens and schools (Wolinksy, 2011). Takahashi expressed that he designs things to help the greatest number of people, and while he dismisses much of his games as trivial, he always designs them to make people smile. Making life more fun is his main motivation (Guillaume, 2011). Katamari Damacy did not make Takahashi smile. In a 2009 Game Developers Conference talk, Takahashi confirmed that Katamari Damacy was about consumption society. This presented a problem: his goal to make things light-hearted, silly, and fun was wrapped up in work that expressed a cynical stance towards society. He stated, “I wanted to make more objects. If there are few objects, I feel lonely. If there are more objects, they will make things more colourful. But when they’re rolled up, they’re gone. I felt empty” (Welsh, 2009). Takahashi’s dilemma was that the game presented his signature simple, soft, and colourful aesthetic, but it came from a place that was fundamentally cynical. He wanted to critique our desire to collect, consume, and progress. The gameplay necessitated that we participate in that consumption. But even before this confirmation, critical commentators were already reading the game as an anti-capitalist, Marxist text. In Ryan Stanci’s Katamari Damacy – A Critique he argues that if the Marxist critique of art links that work to enforce or challenge the values of consumer society, then Katamari specifically comments on a culture obsessed with collecting and archiving (2006). Every time an object is rolled up, it will also appear along with its name on the bottom left-hand corner of the screen. The object is catalogued so that the player can view it later in the game’s menu. In this collection menu, one can view objects based on the location where it was picked up, its size, or by category such as Food, Trash, Fashion, Animals and Children. The online culture that introduced me to Katamari in the first place may be subject to the same critique. The Angry Video Game Nerd’s game collection, like other long-time reviewers’, is massive. Even if they do not explicitly aim to collect, the YouTube content producer is participating in the online archiving of video game footage. These videos influenced my interest in finding and collecting elusive titles like Katamari Damacy. “They collect forgotten and ignored phenomena, they name “dead” objects. According to Benjamin, such an alternative world-view accomplishes a kind of renewal and rescue – children retrieve objects and stimulate life in a frozen cultural modernity; they re-enchant, albeit momentarily, a disenchanted world […] It is precisely in collecting as a child-like ‘mode of acquisition’ that a genuine collector emerges” (1999). I believe that the childlike practice of collecting to re-enchant the disenchanted word is the ultimate achievement of Katamari Damacy. Collecting and archiving is obviously not inherently childlike or innocent. Collecting is a recurring feature of roleplaying and adventure games, and these quests for treasure often have colonial undertones. However, your hours spent exploring a small unnamed Japanese town by consuming every object in sight doesn’t ever feel harmful. The objects of the world aren’t gone forever. Replaying levels is encouraged, and so you are constantly reliving and restoring the world to a pre-Katamari state. Crucially, you never feel as though you have ownership over the objects you collect. They belong to nature or human society; you are just the supernatural force that is tasked with using these objects to produce something new. The collection menu’s whimsical descriptions reinforce this too. It is obvious by some of the descriptions that these objects are foreign to the celestial beings, especially if they are human creations. The King of Cosmos treats these objects with disinterest and disdain. He wants the Prince to create bigger and bigger Katamari, but he is not a hoarder. These balls of objects are only to rebuild the cosmos. These characters are like children too, discovering and coming to understand this world, with some charming errors in their logic. A description of a cheque book reads “A Book Filled with numbers. People smile or cry reading this book. It must be a very good novel”, and I can just image that same understanding coming from a child, asking their parents if they could read along to this very good book they are smiling at. While many are inactive today, there are even Twitter accounts dedicated to these collection descriptions. And while these descriptions can be superfluous to the game play, I think that they were implemented, and even valued by fans of the series shows that Takahashi successfully gave every object some sense of individuality, value and character. The memory of Katamari Damacy, fittingly enough, persists here through the little fragments that literally made up the journey. While it is clear that Takahashi is critical of his own work, ultimately, I don’t think our experiences with his work are in conflict. Takahashi designs works to make people happy, even if it’s only for a brief moment. Katamari, to me, perfectly encapsulated the joy and the silliness of childhood, however brief that experience may be. In part, I recognize that my experience was not entirely of the game’s own design. Due to the time before I owned it, it was already, at least in small part, part of my childhood. This was just a long anticipated opportunity to experience it first-hand. It was like this longing for a place I’ve heard about, seen videos of, but never got to wander myself. More recently I noticed that my parents do something similar on YouTube, watching videos of travelers and tourists exploring never-before-seen parts of their home country of Panama. I think there’s a hope in this practice, that when we get the chance to see it for ourselves, the fragmented ideas of what this place is like, what it is like to be in control of how we navigate it will ultimately feel more satisfying. The magic of that first play through five years ago was that despite all my praise of the game’s design, art style, and music, I have rarely played it since. I think that’s exactly what Takahashi envisioned the game to be. 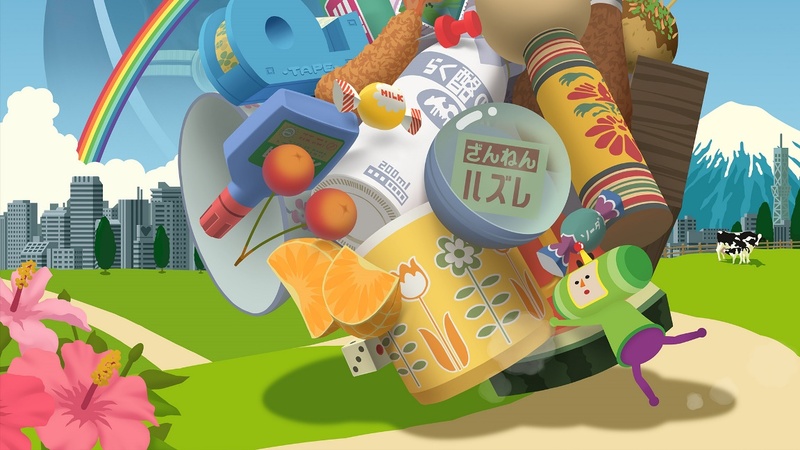 Katamari Damacy can say a lot about culture, our desire to collect, and that can raise questions about how whether that desire can be celebrated as a brief restoration of childhood, or it ought to be critiqued as a product of consumer culture. Considering the gameplay, aesthetic, and design intention of Takahashi, I don’t think that Katamari Damacy picks one side of that coin. But for me Katamari will forever be a happy memory. Guillaume, Alex. “The world is a playground: Katamari’s Keita Takahashi expands his empire.” Vice, 22 August, 2011. Katamari Damacy. Namco. 2004. Video game. Matei, Mike. “Game Collection Page.” Cinemassacre, 22 March 2007. Miyake, Yu. “Cherry blossom color season.” Katamari Damacy Original Soundtrack, Namco, 2004. Napolitano, Jayson. “Katamari music maestro: Yu Miyake interview.” Original Sound Version, 15 December 2009. Stanci, Ryan. “Katamari Damacy – a critique: part two.” Game Career Guide, 28 September 2006. Welsh, Oli. “Katamari was a comment on consumerism.” Eurogamer, 30 March 2009. Wolinksy, David. “Interview: Katamari maestro Keita Takahashi is still plenty playful.” Paste, 9 February 2011.